This past week, I got a call from a local videographer who is producing a series of Public Service Announcements for the City of Indianapolis for their Keep Indianapolis Beautiful program... specifically an initiative to plant 100,000 trees in Indianpolis in the next decade. They were looking for representatives from different faiths, and my local masjid suggested me. I don't know if it's because they know I'm a tree-hugger (and proud of it!) or if they just think I'm photogenic (hah-hah). The lady launched into her spiel about how important trees are, and I stopped her to say, "You don't have to convince me about trees, I've planted nine trees on my little bitty lot." (We've got between a quarter and a third of an acre, but one of the reasons we are where we are is because the lot backs up to a youth camp which has lots of forest.) I don't know yet what lines I'll have to say (something about the joys/benefits of trees), but I'm just tickled pink to be asked to do this! The other opportunity, which I'm also tickled pink to be asked to do, is for Beliefnet, which is launching a new program called Guided Spiritual Journals. Basically, the editors will pose a general spiritual question and then a group of writers from different faith traditions will write a journal entry in response to the question. The initial go round will last for three months and have 24 entries. It sounds like it will be fasicinating, and I'm very honored to have been asked to participate. 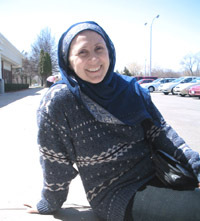 Progressive Muslim, feminist, mom, writer, mystic, lover of the universe and Doug Schmidt, cellist, theologian and imam. 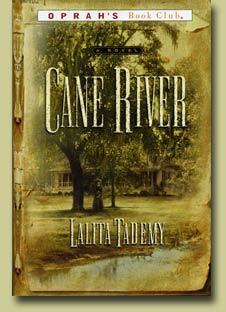 An interesting exploration of the gradual whiting of a family through slavery to modern days. This is just a short list -- a few of my favorites. English Language Islamic Fiction. We need more of it. Lots more. Pay a Teacher's Salary in Afghanistan. The Hunger site actually has a lot of worthwhile programs. You can find them all here . Muslims for Progressive Values. My organization. We can always use donations, of time or money! The ACLU I'm a card carrying member. Hope you'll become one too. MoveOn.org. The organization that has done the most, as far as I can tell, to pull the countries progressive side together. Network of Spiritual Progressives. Working to reclaim religion and morality for the religious left. Writeous Sister Aminah Hernandez, she's got some excellent latino pieces and always has good writing info on her blog. Sister Scorpion aka Leila Montour - Leila is a fount of energy, quirky humor, and bad attitude. She's also a talented poet. Muhajabah Very interesting commentary here. I don't always agree with her, but her pieces are always thought-provoking. Georgie Dowdell Georgie is a great writer and a good friend. Louise Marley Another great writer. I think Louise is one of the best sf writers exploring faith themes. Ink in My Coffee Devon Ellington (who has numerous aliases) who is also the editor of Circadian Poems. A truly inspiring woman with a seemingly endless supply of energy. Ethnically Incorrect With a name like that, isn't a given I'm going to enjoy this writer? Freedom from the Mundane Colin Galbraith, another excellent writer, from Scotland. The Scruffy Dog Review This is a new e-zine with an ecclectic mix of fiction, poetry, and non-fic, some really enjoyable pieces here. Ramblings of a Suburban Soccer Mom Lara, another gentle soul, very thoughtful. Circadian Poems A journal of poetry, new stuff up all the time. Ye Olde Inkwell Michelle writes romance and is one of my writing buddies. Muhammad Michael Knight The original punk Muslim writer. Like him or love him, Mike is always coming up with the unexpected.